The history of the Pushkin family is intertwined with that of the village of Boldino. For those who love Russian culture, the village of Boldino, in the southeastern part of Nizhny Novgorod Region, will always be associated with the genius of the great Russian writer Alexander Pushkin. Having journeyed to his family estate at Boldino on business in the late summer of 1830, Pushkin was forced to stay there in the fall because of a severe cholera outbreak in the territory around Moscow. This unexpected conjunction of events led to a surge of creativity known as the “Boldino autumn.” The several masterpieces completed during that brief period include the final chapters of his epochal novel in verse, “Eugene Onegin,” one of the most influential works in Russian culture. Boldino, however, is not a literary abstraction. Bolshoe Boldino (the official name of the small town) and its surrounding region have a rich history that has been witness to dramatic events such as Ivan the Terrible's campaign against Kazan in 1552 and the Pugachev rebellion in 1774. In the 19th century, the region experienced the difficulties of famine and the transition from serfdom to an underdeveloped form of agriculture. And in the 20th century Boldino, like the rest of the Russia, was drawn into cataclysmic events of war, revolution, collectivization, and a still larger war in which thousands of citizens from the Boldino region took part. The cultural center of Boldino is the estate house of the Pushkin family. The Boldino estate on the small Azanka River has been associated with the Pushkin family since the end of the 16th century, and was formally deeded to Pushkin's ancestor Fedor Pushkin for his services in the recapture of Moscow from the Poles in 1612. 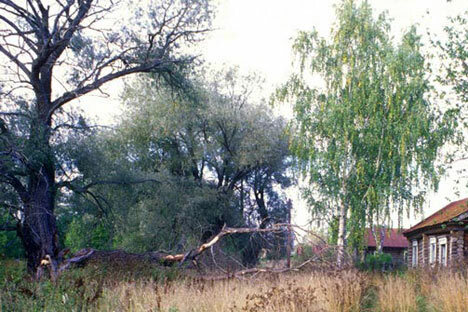 No record exists of the appearance of the early family houses, but the general outline of the present house, with its gabled center, follows a typical pattern for wooden estate houses in the Russian provinces. These sturdy log structures usually had plank siding to create a more imposing appearance. The Boldino house is now painted a bright yellow, although a more usual color for such houses was gray or green. Opinions vary on the age of the present Boldino manor house, which was substantially modified throughout the 19th century. Recent tests suggest that the lower log courses of the main structure date at least to the early 19th century and thus would have existed during Pushkin's visits to the house in the 1830s. The back wing of the house was added in the 1870s. The interior of the house adheres to a 19th-century enfilade plan, with ceramic tile stoves in most rooms and furnishings based on an inventory of 1849. Of special interest is the corner study, where the poet did much of his writing at Boldino. The appearance of the study—sacred to all lovers of Russian culture—has been restored on the basis of a sketch by Pushkin himself. From its large windows, he could look directly to the Church of the Dormition, whose impressive neoclassical form rises above the main square. The Dormition Church was begun in the 1780s by Pushkin's grandfather, Lev Alexandrovich Pushkin, who did not live to see its completion. Construction was continued in 1791 by Pushkin's grandmother, Olga Vasilevna Pushkina, who brought this large project to its consecration in October 1799—the same year the great poet was born. This grand structure, remarkable for a modest village, has a bell tower in the west leading to a large refectory with two altars dedicated to St. Nicholas and the Archangel Michael, the patron of Pushkin's ancestors. The large refectory (the widest part of the church) leads to the main space, which soars in an octagonal tower above the neoclassical portico of the facade. Prints of early 20th-century photographs displayed near the entrance of the manor house show just how effectively the Church of the Dormition organized the space at the center of Boldino. Although it is difficult today to understand how such an extraordinary landmark, so close to the life of Russia's greatest poet, could have been almost destroyed, this was indeed the case. Perhaps the very monumentality of the structure worked against it during the Soviet campaigns against religion. The church’s two towers were dismantled in the 1930s, before the 1937 centennial of Pushkin's death. Work began on demolishing the rest of the church in the late 1950s, during the renewed campaign against religion during the Khrushchev era. Fortunately, vigorous opposition at the regional and national level led to the preservation of the remaining space in the 1970s and 1980s, when it was used as the local library. During the 1990s, the church and its demolished parts were impeccably restored and finally reconsecrated in 1999, the 200th anniversary of Pushkin's birth. The restoration of the church to an active role in the Boldino community is not only a spiritual matter, but also returns to us an indispensable part of Boldino as it existed in Pushkin's time. Adjacent to the territory of the Dormition Church is the House of Culture, a large unstuccoed brick structure built for the 1937 centennial. Although clearly intended to replace the church in the life of Boldino during the Soviet era, this building—imposing in its own way, with elements of neoclassical design—now coexists with the church and continues to serve the community with concerts and other events. In addition to the manor house, the territory of the museum park includes several smaller structures, such as a separate kitchen wing, the stables and carriage shed, the house for domestics, and the estate office—all of them log structures. The park also contains an apple orchard and four ponds that descend in steps to the Azanka River. This cascade of ponds was a feature of a number of late 18th and 19th century estates, and is an authentic reminder of the Pushkin family's constant efforts to ensure that Boldino was a "civilized" estate. A recent addition to the park is the traditional log Chapel of Archangel Michael, located on the site of the ancient estate cemetery and completed in 1999 as part of the bicentennial of the poet's birth. Although the chapel is not used for worship, its location provides an inspiring view of the surrounding landscape. The Boldino region is dotted with other villages that preserve fragments of 19th-century estate culture. Foremost among them is Lvovka, created in the late 18th century by Pushkin's grandfather, Lev Alexandrovich, as a secondary estate to Boldino. At first the estate languished, but its fortunes improved in the 1840s, and in 1856 it became the residence of Pushkin's son, Alexander. The main house, with its masonry ground floor, has been handsomely restored. Nearby is the late 19th-century wooden church dedicated to St. Alexander Nevsky. Recently restored, the church is a good reflection of the former size of the village of L'vovo, now almost entirely abandoned. The manor house at Lvovka is marked by tall pines, some of which were apparently planted during the time of Alexander Alexandrovich Pushkin. The Boldino district is blessed by the beauty of its rolling landscape and by the remnants of an architectural heritage connected to the Pushkin family. Despite its rural location, Boldino is accessible via paved roads, and it has a comfortable hotel suitable for a major heritage site. Boldino is well worth a visit in spring and summer, but early fall has a special charm, when the apple orchards are ripe with fruit and the harvest is in. This is the time of year that Pushkin loved above all.